Michael Clemens on the typosphere page recently set a challenge to us typewriter fanatics for typewriter day to “honour your roots“. Well, I don’t think I can do that any better than to talk about a typewriter that has more personal significance to me than any other in my collection. 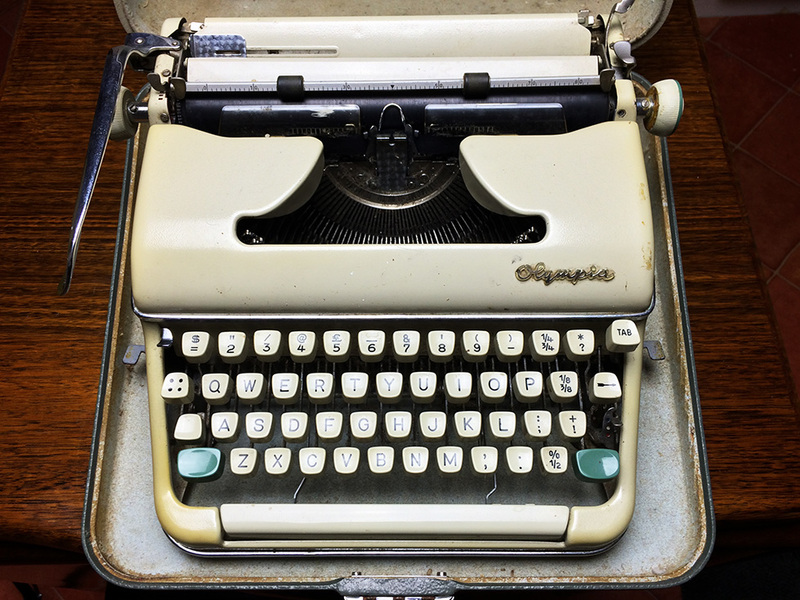 This the typewriter that belonged Jillian – my long passed mother. The typewriter I speak of is a dirty and grimy Olympia SM5 machine that has clearly seen plenty of usage, but is still going strong. The paint has been battered by the sun and nicotine, and there’s a screw missing from one of the cover-plates. However the under-shell grommets have been replaced some time back, and despite the machine being full of filth it still types like a charm. If you were to come across this machine in a writer’s den it would visually conjure up an air of romance due to its lived in but still beautiful feel. And while I call this typewriter ‘Jillian’s typewriter’, the reality is that it is my entire family’s typewriter, and it has been as used as it looks. When I started really get into using and collecting typewriters I asked my father about this machine. I knew it was somewhere, but I only had vague memories of how it looked and as I just wasn’t sure what model it was. I remembered it being white with green shift keys – and so I was figured it was an early Olympia SM9. But for some reason that didn’t seem right in my memory, and I really wanted to get hold of it to make sure. I knew really I wanted to get my hands on this machine. 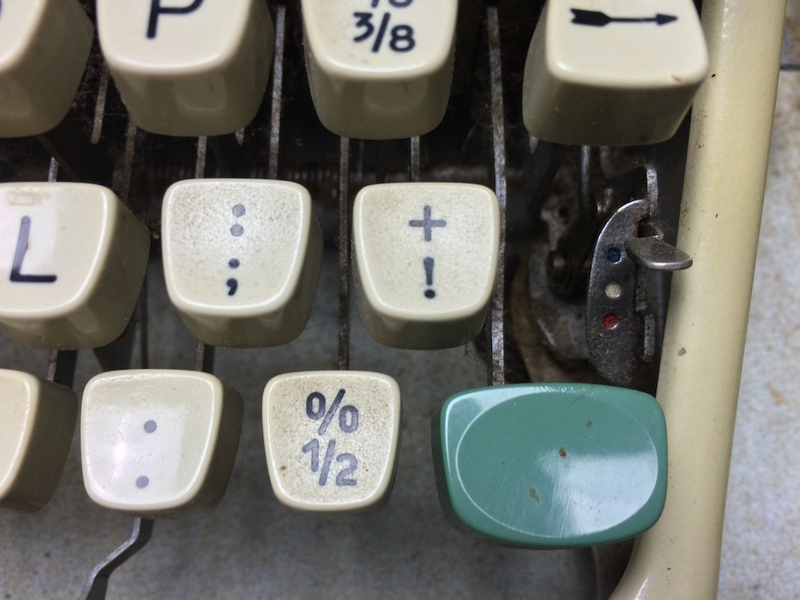 This typewriter isn’t just my mother’s, but it is also a link to my grandfather. It is likely he changed those failing grommets when he last serviced it in the 1980’s. My grandfather – a typewriter mechanic by trade, would have certainly have given this machine a going over before it was handed on to my mother. Apart from my grandfather’s job working for Chatres & Remington, he – like most other mechanics at the time, happily traded machines to interested buyers and would have sourced this machine for my mother. I’m not surprised by my grandfather’s choice of an SM5 considering Olympia’s excellent build quality, and what my mother was going to be doing with this machine. 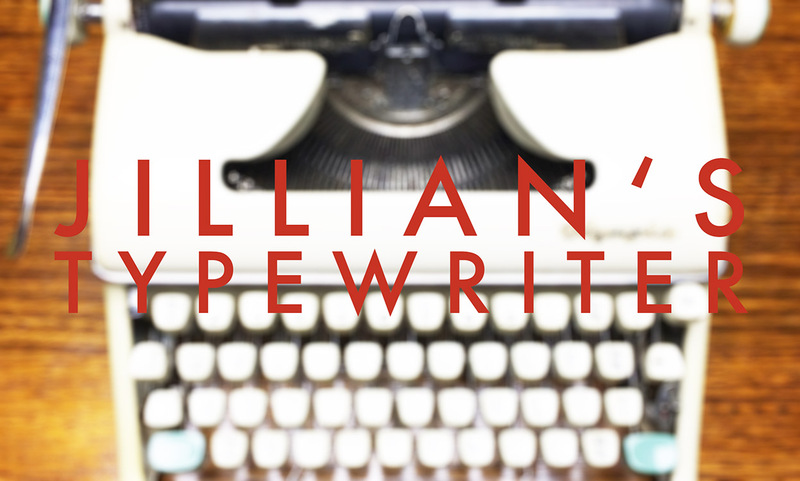 Memories of Jillian and her typewriter. My mother was diagnosed with multiple sclerosis in the prime of her life. But she was also a persistent woman that lived with an absolute determination that whatever nature took from her life, she was going to strive even harder to make her life count and take more from it than she lost. Like many from my parent’s era my mother and father had both left school in their mid teens to get work – and as such never finished high school or undertook tertiary study. So in the early 80’s both my parents decided to finish their high school certificate and then go to university. Both my mother and father went on to study social science, however my father also undertook anthropology and law. My mother had worked as a payroll clerk for the railways in the 70’s, where she felt first-hand the sting of gender inequality. I always knew my mother to be a strident feminist, and she often put it down to her days at the railways where she would see men promoted above women despite doing far less work, where they were often better paid as well. My mother was determined to finish her degree – despite also looking after two children while her body progressively rebelled against her. My sister and I became very used to hanging out in university lectures and tutorials. Jill’s condition started to make it hard for my mother to take notes during these sessions, and to compensate she started to take a small dictaphone with her everywhere she went to record what was going on. It was during this time that the Olympia came into our home. We always had enjoyed a steady stream of typing machines into our house courtesy of my grandfather, however my parents got hold of this machine specifically for their study. As both of them were studying at the same time, this typewriter was in constant use by either of my parents as they alternated. My mother would set this up on a card table in the lounge so she could watch both Jenny and myself while she powered away at her assignments and letters. Both my parents were heavy smokers, and when you look over the SM5 it is unavoidable to notice the amount of nicotine that has encrusted on much of the machine. Every day of their study is literally burned into the paintwork of this typewriter. It was rare that I would come home from school and not find a lounge room filled with smoke, and my mother or father hard at work on the Olympia. For a short period my parents also owned another machine that was electric, and had a script typeface. 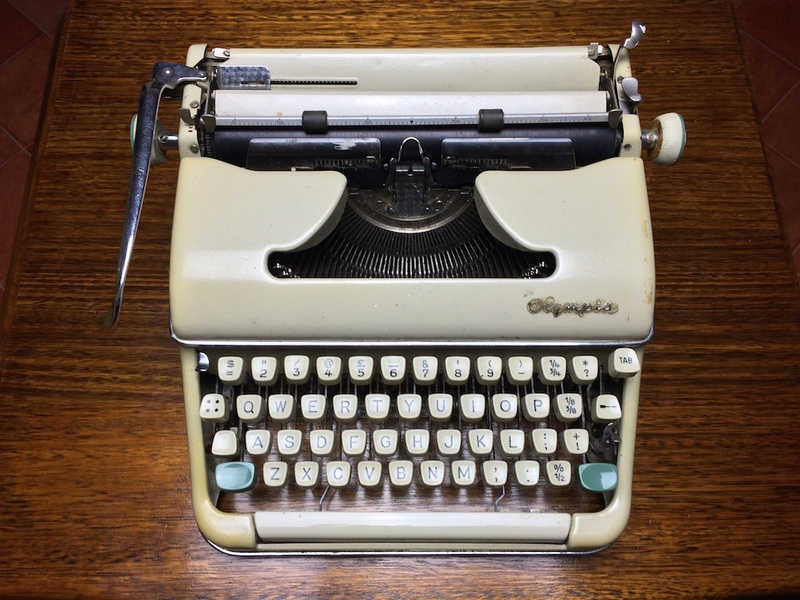 But with my father working less and less to study and take care of my mother, such luxuries weren’t kept – and despite my mother’s wanting of a script machine, this typewriter was sold on. Oddly, when my father uncovered this typewriter mixed into his stuff recently, he was certain that it was a script machine – and even told me so. Much to my miss-placed excitement. My father even told me that he submitted assignments to uni that had been written on a script machine, and was sure that on one occasion it even bumped a mark up to a higher grade due as a result of being loved by a particularly script typeface appreciative lecturer. As the years progressed my mother started to find it hard to operate the keyboard, and my father would often type my mother’s assignments for her. My mother developed a tremor in her neck about halfway through her studies, and I still have a very vivid memory of coming home from school and finding my mother typing at this olympia with sheer determination, despite her head rocking from side to side uncontrollably. As I said earlier, she was determined to take the life back from nature anyway that she could. In 1987 both my parent’s completed their degrees, and the long-suffering Olympia was put to rest, having probably written hundreds of thousands of words. My memories of this machine. Everything in that room seemed high-tech and futuristic, and I was determined that as well as being an astronaut, I was going to get into the world of computers. By the mid to late 80’s when I was in high-school, everyone I went to school with had a Commodore 64 computer. I begged and begged my parents for one, but while my parents were studying, we didn’t have a lot of funds left for things that seemed like a luxury. Eventually my parents decided that it would be a good idea to buy a computer, but they weren’t going to just give it to my sister and I without some work. So out came the Olympia, and it was placed onto the dining room table where my sister and I were set a simple task; we were to both write a 5 page essay as to why we needed to get a computer. My parents had been teaching me to type for years, however I still wasn’t the proficient touch typist that I am today. As such the 5 pages seemed to take a lifetime to get through, even if it was really just three days. My sister finished first, and on the day that I worked through my final page of the essay, my father arrived home with a big box under his arm. It was our first computer – an Amiga 500, which was one of the first of that model in Australia. We never would live the idyllic family life, and both my sister and I learned how to be fiercely independent and able to look after ourselves before our teen years. But my parents tried damn hard while pursuing the things that could have made our lives better. They seemed to have a vision of a future that was filled with hope, in a situation where hope was being drained by the day. And with that in mind I feel that it is an honour to now look after this piece of my family’s history. A piece which has a connection that goes all the way back to my grandfather (who I talked about in a previous blog). This may not be what the members of the typosphere had in mind when they suggested to honour our roots, but sometimes I just have to take the time to highlight that I love my family and the life they gave me. Oh yeah, and I love the Olympia SM5 that they gave me to. It’s one of the machines that I was struggling to find to complete my entire Olympia SM pre & post war collection. But I’m a bit stuck now. I’m not sure if I should clean this typewriter up and service it – or just leave the ribbon, grease and nicotine that this machine has been filled with that was put there by my Grandfather, my mother and my father. Don’t you just love me! Come on and type. do not clean it! That’s the breath of your forebears! I’m with Ted but it is up to you obviously. Even as a smoker, I really don’t like the way old cigarette tar and typewriter oil smell together. That’s a lovely tribute to your folks by the way. I agree with the consensus—thanks for sharing that bit of history, and there’s no way you should clean it up too much even though if I were in the same place I’d be tempted to. Nicely done! Don’t know if I would clean it either. Maybe air it out and see if that diffuses some of the nicotine odour. It’s always nice to hear the personal/human history of a typewriter and this was a very touching one. A lot of it struck a chord with me since I grew up in a similar family environment around the same time, Glad you ended up with that typewriter and not a Commodore 64. Wow. That’s a tribute alright. Very touching. Thanks for sharing this.